Who doesn’t love a Yeti?!? I live in the Pacific NW, home of Sasquatch, so we know there are crazy wild beasts wandering in the great outdoors…..especially with dogs and penguins for buddies! 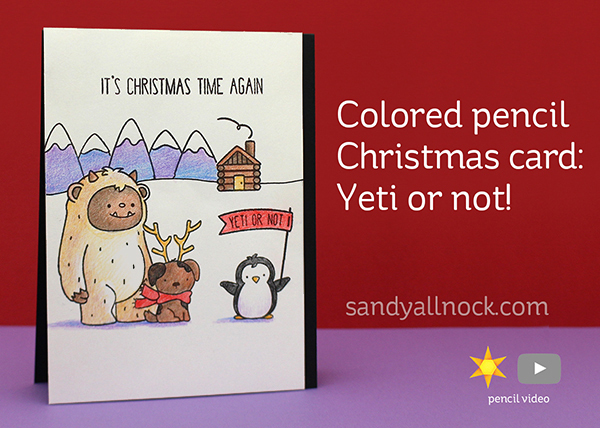 I colored up this little card with Prismacolors – hope you enjoy! Watch the video below or click HERE to see it in HD on YouTube. This is such a super sweet card ! It came out so cute.Love it. This is so cute Sandy. Your scenes always put a smile on my face. Thanks for that! 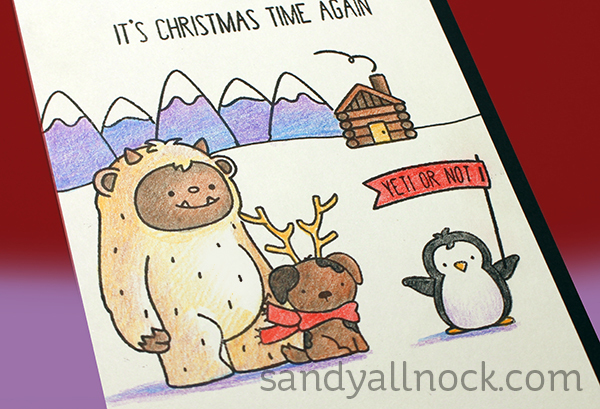 Such a sweet card, Sandy. I may well be the one exception to the rule here, but I really don’t ‘get’ other people’s excitement over yetis. In fact, this N&T version is the first yeti stamp that I do like (sort of).